Alyssum Purple Royal Carpet Lobularia Maritima is a popular garden annual that can be easily grown from Alyssum seeds. 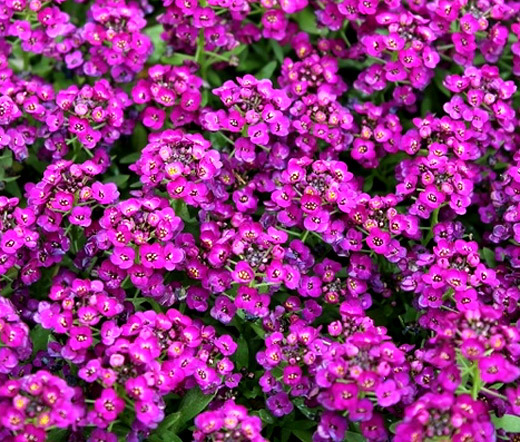 Also known as Sweet Alyssum or Sweet Alison this very compact variety forms a dense carpet of medium green foliage that is completely covered with sweetly-scented, dark purple clusters of small flowers. The blooming Purple Alyssum attracts masses of bees and butterflies. Alyssum grows fast and makes a superb ground cover for a summer. Purple Royal Carpet Alyssum is one of the best choices for borders, rock gardens, containers, pots, hanging baskets, and window boxes. Lobularia Maritima grows best in full sun or partial shade tolerating occasional drought and heat.